About seven years ago, I was a drug addict convicted of aggravated burglary and robbery. 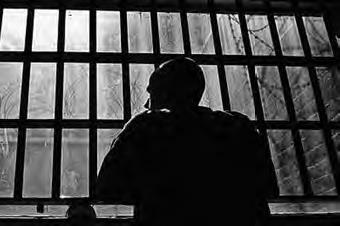 I was sentenced to 10 years in prison, some place called Lorain Correctional Institution. I believed I already knew the Lord before I got arrested, but thought I could do it my way. When I got to Lorain CI, I invited the Lord into my heart for real and began going to religious services there. It was during this time that they announced a bunch of crazy guys were volunteering to come into the prison to play softball. The team that showed up was called the Saints Prison Ministry. I went to the game and found it very entertaining. After the game some of the men began to talk and fellowship with us. One man in particular spoke with me, so I shared with him that I had no family, and my whole situation up to that time. That man talked with me and shook my hand and took the time to pray with me. He explained what the Saints Prison Ministry was all about and why they were there. When we finished that man took my name and number – and he also took a piece of my heart with him! I have very few people in my life, but he showed me compassion and friendship. Every year on November 16th I receive a birthday card from the Saints Prison Ministry, and I get letters from him. Words cannot express how uplifting those cards and letters are to me. I am so thankful for all of you, I appreciate your time and the things you do for people who are forgotten. My only request is that you pray for my son. I haven’t heard from him in over seven years and it is my prayer that we have the opportunity to bond once again. I’m praying for you! Some men live for others and make their presence known….some live in seclusion and choose to live alone. Some men stand for justice and walk inside the law, but of all men the group I’m in, is the men behind the wall. We’ve given up our freedom, we’ve sacrificed our rights…by day we walk in darkness, and sorrow fills our nights. We’ve learned to hide the teardrops, but still the teardrops fall. We cry alone and hope seems gone, for the men behind the wall. Some have lost their families, most have lost their friends…today will bring more heartache that tomorrow cannot mend. Where letters are not answered and no one takes the call, we count the cost – how much is lost – for the men behind the wall. If anyone is righteous, then let him cast the stone…and if you’ve known perfection, you’re sure to die alone. The one man who was perfect was judged in Pilate’s hall, he knows best all our debts, and loves us yet……we men behind the wall. Not long ago my family and I were invited to attend a DeSales University Alumni Celebration, in conjunction with the final Men’s Basketball game of the season. The Alumni celebration afforded me an opportunity to connect with players I had the privilege of coaching years ago, and I enjoyed catching up with many of them. But in the main event, although a crowd of 475 encouraged the team right up to the final buzzer, the game ended in a devastating, season-ending loss, 76-67. Just as the game ended I received a text message from Saints NJ Basketball Coach, Carl Bogan. You see, while I was enjoying the collegiate game, our missionary-athletes were also on the court at Eastern Correctional Institution, at the southern end of Maryland’s Eastern shore – and they had played two games in the same time frame as the collegiate game I had just watched! 31 first-time professions of faith in Jesus Christ as their Lord and Savior! God’s timing is impeccable! God’s Kingdom is at hand and His mission to deliver the lost is the real game. Life becomes overwhelming when we continue to strive for the things that perish, but when God grips our heart with the treasure of being on mission for Him I agree with that Father ……“This is what it is all about, Amen! Father Gordon MacRae, a priest incarcerated in New Hampshire State Prison, has captured the very essence of why God has called us to this ministry. It is our privilege and responsibility to lead men to the foot of the cross and allow them to meet the Risen Jesus that has the power to change their lives forever. We encourage you to take the time to read the entire article and the comments below it to see how God used 14 willing men to reach every man in that yard and beyond the prison walls as well. This is the story of two men from different backgrounds that found friendship in prison. Yucel is originally from Turkey; Darrell is a lifelong Georgian. Here is their account of God working in their lives, as told to our Director in the prison yard one hot afternoon. Darrell: Mine is the story of a young man who was very lost. I am youngest of seven children and my mother worked all the time to keep us alive. Consequently, I did what I wanted when I wanted. I never went to school or church and never learned to spell my own name. But I did learn a lot about drinking and drugs! As an adult, I had a wife and a son that I worked hard to take care of, but the drinking and drugging began to take over my life. What I thought was bringing me happiness was really destroying me and ultimately landed me in prison! Yucel: I don’t talk about my past, but I am so very far away from home here in this prison. I was sure no one cared about me and no one was even concerned about where I am. I have never been so lonely. But then I met Darrell. Darrell: I had lost everything that I thought would make a man happy – all I had left was the hate! But I was still searching and I began praying and studying. When I met Yucel, it was like a breath of fresh air or a gift from above. Yucel: Darrell didn’t know how to read or write, so even though English is my second language I was able to help him with some things. It made me feel good to be able to help someone in this way. Darrell: Yes, Yucel helped me to fill out my store list and write a letter to my mother. It was good to have a friend but I didn’t give God much credit for it at the time. Yucel: I was just glad to have someone to be friends with. It is hard to make friends in prison but now I had someone to walk the yard with, someone to workout with, and someone just help me through the tough times. But it ended too quickly. Darrell: I agree. I was released from prison and had to say goodbye to my new friend. Once I got out, I stopped praying and went back to looking for answers in the bottom of a bottle. As it had done the first time around, that lifestyle landed me back in prison in just a short amount of time. Yucel: I knew I was going to miss Darrell because he has such a good heart. I was transferred to Waycross SP and was certain that I would not find another friend like Darrell. Darrell: When I went back to prison the second time I was sent to a place far from where I lived – Waycross SP. No one was coming to see me there and I expected to do my time quietly. But I was on the yard one day and would you believe it, there he was…my friend from another country! Yucel: Yes, we picked up right where we left off, just like old friends always do – walking the yard, lifting weights, and hanging out. It was great to see my old friend again! Darrell: It was refreshing to see an old friend when I was at another low point in my life. I began reading, studying, and praying again only this time I started to see what I had been missing. I started to understand that God had a hand in all of this and He will for my life was not to be found in a bottle. I was released again but this time I kept my nose in God’s Word and continued praying and reading. I found my happiness in God and didn’t need to go back to drinking. But make no mistake, sin has consequences! For a third time I found myself going back to prison. It is hard to explain but it was a legitimate reason for sending me back. This time to a prison I had never been to. Yucel: And then it was my turn to leave Waycross. I wasn’t released but I was transferred again, this time to Dodge SP! I walked in to the cafeteria for lunch one day and there sits my old friend Darrell! What a blessing to see him in just my second day in my new surroundings. Darrell: That’s right – three times in three different prisons God brought us together! I began wondering if he was really a man from another country or an angel sent by God to keep me straight! Yucel: I thank God every day for having us meet; good friends in any life are hard to come by but to have a good friend in prison is an incredible blessing! God has shown me blessings and He has shown me miracles. I’m calling him a miracle by the grace of God!